Do You Produce Food? MarketMaker Webinar offered this Friday! If you are an OSU staff member click on the OSU login tab that allows you to log in using your OSU username and password. If you are a guest click on the Guest login tab to enter, when prompted for a log in name under Guest, just enter your name. If you have any problems getting in to the webinar, please give Charissa at 740.289.2071 ext. 132. OSU’s Annual Trial Garden is where YOU can get info on annuals to include in your sales plans. We at the OSU Annuals Trials will have a couple of open houses for you to evaluate the performance of numerous plants in ground beds, containers in the sun and shade, and hanging baskets. Growers, independent garden center buyers, landscape designers, and installers are encouraged to visit and take note of the new varieties being grown. You can also observe and study the different growth habits, tolerances, and visual characteristics of the many different varieties that have been put on display. In addition, 2014’s trial celebrates the “Year of the Phlox.” Attendees will have access to the Ornamental Plant Germplasm Center’s Phlox collection, displays, and research. On top of that, visitors will have an opportunity to enjoy the newly inaugurated Howlett Hall “green roof”. Are you coming to the AmericanHort Cultivate’ 14? If so, you will be able to take a bus (courtesy of AmericanHort) at the Columbus Convention center which will bring you to campus. Please check the Cultivate’ 14 program for details. If you come on Monday July 14, we will have a reception sponsored by Blooms of Bressingham and the organization of the Chadwick Arboretum. OCNT, Landscape Industry Certified, and ODA pesticide credits will be available. A wide variety of annual plant material will be presented so industry professionals can evaluate and note those that have commercial application in Ohio. How Local is “Locally Grown”? I enjoy visiting the independently-owned-and-operated greenhouses and garden centers in my region of Ohio – and when doing so also make it a point to visit the surrounding box stores. I like to compare the product selection and quality, pricing, and see what type of consumer shops in each store. This can be an eye-opening experience! 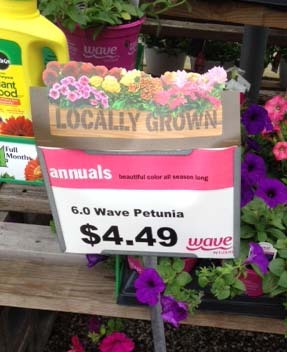 In looking at the individual container labels, these wave petunias and other plants similarly advertised were grown 158 miles and 2 hours and 21 minutes away (according to MapQuest). While I couldn’t find a description or definition of local in the store itself, the box store website explains that they work with “local growers in the five states” they service to source their flowers and plants. So how far can a “locally grown” product be grown and still be considered “local”? I’m not sure this question can be answered in a way that would satisfy all of us. Do you consider this to be truth in advertising or misleading to the general public? One thing is certain, it is interesting to see how businesses are defining and sourcing “local” products. Retail Technology – What’s Trending? I recently visited a local garden center and was excited to see that cash registers had been replaced with sleek iPads fitted with credit card swipers. What’s so great about that? Just think of all the benefits for the consumer – faster checkout times, receipts can be emailed instead of just printed, items can be paid for with cash, credit or even by Paypal account. For the retailer, the simplicity of using touchscreens, smaller size and portability, and access to sales data at a moment’s notice provide huge advantages over traditional cash registers. While I am not endorsing any company providing iPad POS systems, here are just a couple of examples of the types of products and services available: ShopKeep and SquareStand. So where do we find out about advances in technology and how we can incorporate them into our businesses? There are many avenues – tradeshows, trade magazines, fellow retailers and wholesalers on the cutting edge – as well as the internet! I recently stumbled upon a blog titled “Retail Technology Trends” with tons of short but fascinating snippets of information on ideas and products in the market today – or one day in the future. If you have a few minutes to check it out – I suggest you do! For example – a new trend is the use of “beacons” – an iBeacon fitted in sunglasses would alert your mobile device when you are more than 16 feet away! The possibilities are endless…. Every year, car manufacturers come out with new models. Some are slight variations of previous models; others may have radical changes. But any change is costly to the car maker. Why do car companies go through such an expensive process? They do it to keep customers’ interest high with the hope of increasing sales. For similar reasons, plant breeders are constantly looking for new cultivars for all traditional floriculture crops. It is essential to keep customers excited and interested. Some of the new cultivars may look very different in shape and color and they may be produced keeping in mind the general public. Others may be similar in looks to cultivars already in the market but may have characteristics that are very attractive to growers for their ease of production or increased profitability. Poinsettias are no exception. In the last fifteen years, we have seen numerous, exciting changes from what used to be a “traditional” poinsettia cultivar. This is why we, at The Ohio State University and AmericanHort (former OFA), collaborate on a poinsettia rating project that permits growers to know what consumers and fellow greenhouse growers think about the new poinsettia cultivars. The plants were grown at four locations around Ohio: Barco & Sons, Inc. in Medina; Dill’s Greenhouse, in Groveport (South of Columbus); H.J. Benken, Inc., in Cincinnati; and Bostdorff Greenhouse Acres, in Bowling Green. One plant of each cultivar from each of the growers mentioned above was shipped to the Department of Horticulture and Crop Science at The Ohio State University and placed in the Howlett Hall greenhouse. 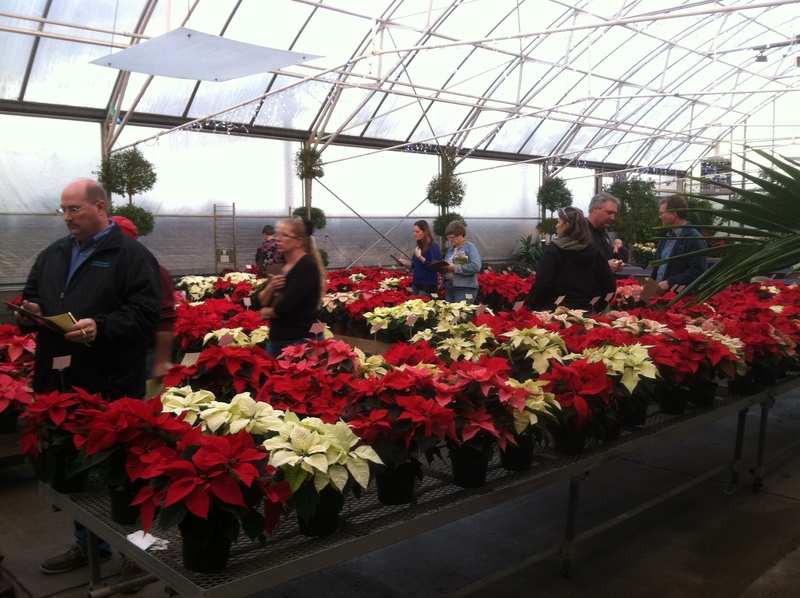 On December 4 and 5, 2013, the horticulture student society PAX held its annual poinsettia sale in the Howlett Hall greenhouse. We asked PAX’s poinsettia buyers to evaluate the poinsettia cultivars that were displayed – with only a number as ID – on the greenhouse benches. We asked the consumers to evaluate the cultivars in two ways. First, we asked them to rate each cultivar (four plants of each cultivar grouped together) on a 1 to 5 scale with “1” meaning that the consumer did not like the cultivar and “5” meaning that they loved it. This rating scheme allows for positive and negative feelings for each cultivar. Second, we asked participants to tell of all cultivars that we had, which were their three favorites. That is, which three (maximum) they would buy on an impulse if they found them while shopping. Results are given in Table 1. This year, only two cultivars had ratings above 4: ‘Jubilee Jingle Bells’ (4.2), and ‘Christmas Joy’ (4.1). Five other cultivars received ratings of 3.8 (Table 1). ‘Jubilee Jingle Bells’ was also the most selected cultivar (45 times) while the Selecta SK 108 was second with 23 selections. ‘Monet Early’ (EU354S) was third with 18 selections. In past years, asking evaluators to pick their three favorite cultivars resulted in discrepancies between top rated and top picked. This situation did not happened in 2013: the top rated cultivars were also the top picked ones. The Jubilee Jingle Bells cultivar was picked by 32.7% of women and 30.3% of men; SK 108 was selected by 14.4% of women and 24.2% of the men. One final observation from this year’s consumer trial that has been seen in many of our previous year’s trials … based on overall ratings, seven of the ten top rated cultivars were red, but the top rated cultivar was a novelty type. We also asked growers to evaluate the same cultivars. This was done during an open house at each of the three locations where the poinsettia plants were grown. While consumers evaluated a group of plants (one from each grower), the growers evaluated only plants from each location. Pooled results are presented in Table 2. The cultivar ‘Monet Early’ was rated the highest (3.9) among growers (Table 2). The Dummen cultivar, RF GL 130,1 was picked 8 times as the grower favorite despite receiving a rating of 3.6. ‘Mars Pink’ received a rating of 3.8 and was picked 7 times. In general, growers were harsher than consumers in rating the poinsettias. It is obvious that growers and consumers evaluate the poinsettia plants using different criteria. In these trials that we’ve conducted over the last ten years, we’ve found that it is typical for consumers and growers to have different preferences. That is our quick take on this year’s results but there is much more information to glean from the trials. What do you see? Acknowledgments: We thank Lindsay Pangborn, Annuals Trial Manager, and the Chadwick and Master Gardeners volunteers for their help with the consumer evaluation during the PAX poinsettia sale, and the four Ohio growers who grew the plants for the trials. Evaluation of poinsettia cultivars by greenhouse growers.